Mini Me and I baked last weekend… we should have made Gluten and Grain Free Hot Cross Buns… we actually made non Gluten and Grain Free Rock Cakes. I blame the fact we didn’t have any ground almonds, which aren’t my favourite thing, so a food item I do not tend to have in my cupboards. The almonds were substituted for flour and before we knew it, our Rock Cakes were rising in the oven and cooking nicely. Made even nicer by the fact we used Sweet Freedom Dark Natural Sweetener as opposed to sugar! All the children enjoyed the cakes so much… there was not even a crumb left for me! 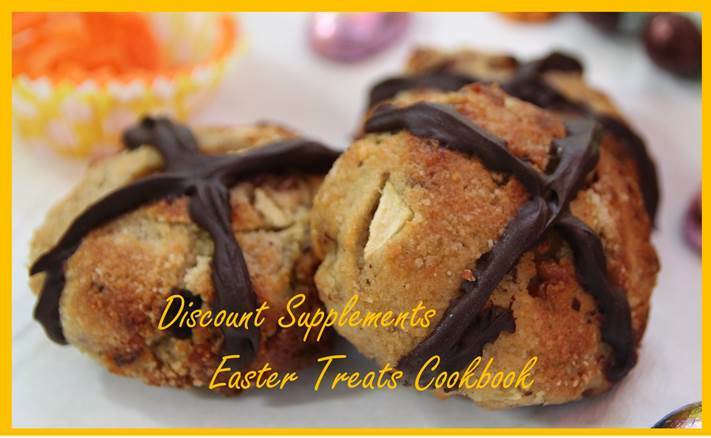 So, if you are actually more prepared than myself and actually like almonds, here is the Gluten and Grain Free Hot Cross Bun recipe – you can also check out further healthy Easter Recipes from Discount Supplements Voucher Code and purchase the Sweet Freedom range! Mix all the ingredients together and spoon out small portions onto a baking tray (mixture makes approximately 14 hot cross buns). Bake the Hot Cross Buns for 20-30 minutes or until golden. Remove and allow to cool on a baking rack. Drizzle the Sweet Freedom Choc Shot sauce to make crosses on top of the buns. Such a quick and easy recipe to make and fun to involve the children in making this Easter.